There are plenty of controversies for Bruin fans to get absorbed with right now, including the Quarterback Controversy, the “13-9 was a fluke” Controversy, and of course, the Dump Dorrell Controversy. This Site never wanted to get embroiled in these sorts of things. We always wanted to unite – not divide – by concentrating on the Evil of usc. As it turns out, there is a small contingent of Bruin fans who DON’T hate sc, and therefore don’t appreciate our point of view. Well, these are people who do not comprehend the importance of The Rivalry, and are therefore, NOT REAL BRUINS, so we don’t care what they think. For Olson to be able to handle sc’s Defensive pressure, the Bruins will have to have an OUTLET Receiver on every Pass play. In other words, as soon as Olson STARTS to drop back and he sees the pass rush starting to break through, there should be a guy on a Screen-type pattern to quickly dump the ball to. Without this safety-valve, Olson will be knocked out in minutes, and the 3-way QB Controversy will have one less participant. As for the “fluke” debate, of course we think that’s ridiculous. It’s not like the Bruins benefitted from a horrible fumble call like sc did the year before. The 13-9 victory was all about Defense, and a Defensive SCHEME that overwhelmed an Offensive Game Plan. The same match-up would have yielded the same result more often than not, if the game were repeated over and over, so, NO FLUKE. 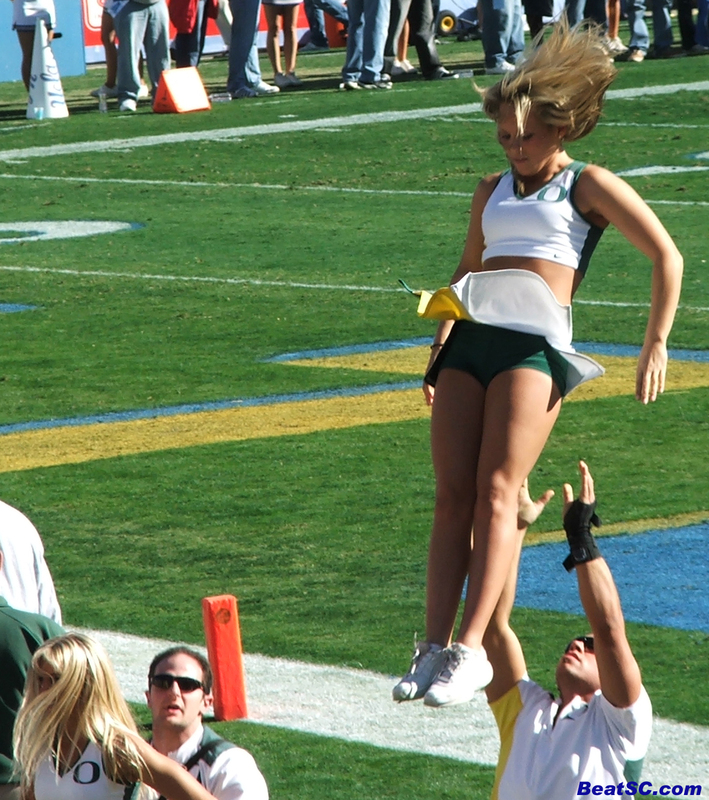 And instead of dealing with the Coaching Carousel that’s about to start spinning faster around here, we’ll talk about a more absurd Controversy: The UCLA vs. Oregon Cheerleader Challenge. Some upstart suggested that the Oregon Cheerleaders were so hot, that they might even be the BEST in the Pac-10. Obviously, we took umbrage at that outlandish statement. Now, there were two ways to approach this discrepancy of opinions: We COULD have posted our LEAST-flattering photos of the Ducks, and juxtaposed them with our Private Reserve Bruin Cheerleader Hall of Fame Shots. But instead of taking that easy route, we’ve decided to post our next dozen BEST Duck Shots all together here tonight. They are nice, but anyone who has been paying attention to this site the last few years will still come to the realization that the Ducks will have to settle for Pac-10 Runners-Up. And after putting this issue to bed, we can go back to concentrating on Beat SC Week, hoping that our expectation for the Game is just as wrong as last year’s expectation was. "DUCKING THE ISSUE" was published on November 27th, 2007 and is listed in Blue & Gold News, UCLA/usc/Cheerleader Photos. i’m a REAL BRuins and I love this site!